Chetan Bhagat is one of India’s most known authors. He’s the author of five novels and a collection of essays. All five novels have either already been, or expected to be, made into movies. The cover is somewhat like a college notebook, and the book is subtitled what not to do at IIT. The cover talks of a college story, of three friends and the darker side of IIT. Chetan Bhagat is one of those authors I’ve loved and hated. I guess not every book can be a super hit, but I’ve read four of his five novels, felt two was average, and two was way below par. I’ve this habit of not reading books in order. So when one of my friends saw that I’ve not read CB’s debut book, Five Point Someone, she gave me her copy and told me I have to read that. I decided to complete the set of CB novels and took it eagerly. 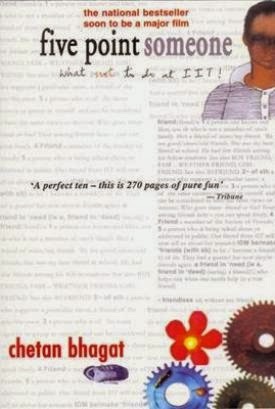 I’d heard rave reviews of the book from most of my friends, and with the movie 3 Idiots being adapted from this one (loosely adapted, I might add), I thought it possibly couldn’t be worse than the two novels I’ve felt way below par. Five Point Someone brings to us, the story of three friends and their life in IIT. These three friends are linked, not by common points, but how they don’t have much in common at all. It tells us of their studies, their friendship, their obstacles (including the teachers), the ragging and the revolt and many other aspects of college life that many of us might be able to relate to. Is the book memorable? No. Not very. It’s a simply written simple story with not a lot of twists and turns etc. It’s a fast paced book which you might pick up on a journey and the plot keeps you occupied for a few hours, save you from boredom on that. There are various characters that you can step into the shoes of and possibly understand their life. You feel intrigued by the depth of friendship between the main trio, and you do wish for a happy ending to the novel, which does happen. This book however is not for those who are really in love with English (like me), and you wish it was narrated better. Looking at the plot more critically, the actions of the characters may not make sense at all, and you start banging your head as to why you took it up in the first place. (It’s something that has happened to me when I’ve read his other novels). Want a book that’s a definite one-time read and has only enough to keep the imagination occupied for a few hours? Then perhaps this is a book you can try. Not one of my favorites, but not CB’s worst either. I have felt exactly the same about CB books.. I read two states and One night at a call center and took a vow(just kidding, but am pretty sure its a easy one to keep) not to read CB anymore!